Hiroshima University is located in Hiroshima, which was proclaimed a City of Peace after the dropping of the atomic bomb. One of the basic principles of the university is the pursuit of peace. The taoyaka society that is the aim of this program is based on this principle, and we believe that because of its principle of pursuing peace, this is an issue that must be addressed by Hiroshima University. 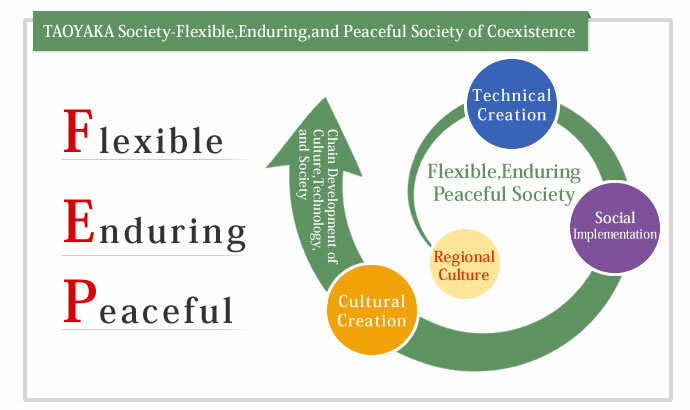 A flexible, enduring and peaceful society of coexistence may be defined as a society that can flexibly address various different issues, an everlasting society that creates culture and carries on cultural traditions, a society where people can live with peace of mind. To this end, we are initiating an educational program to train human resources who can take the lead in development that connects culture, technology and society. This is also a new initiative in the peace education that Hiroshima University has implemented for many years. Onsite reverse innovation is comprised of reverse innovation that functions in the opposite direction of conventional technical seeds innovation, with ideas generated from regional cultural and social issues, designed to respond to social needs, as well as onsite innovation, addressing individually the various issues in the respective regions. We believe that there is not one single answer for the science and technology required for increasingly diverse cultures and societies; rather, there is a need for various technologies that suit respective cultures and societies. And we believe that it is the practical application of onsite reverse innovation ? in other words working closely with regions facing difficult challenges, developing ideas based on their needs, developing issue-resolution technologies that lead society more effectively in the right direction, and training people to take the lead in the mutual creation of regional culture and state-of-the-art science and technology ? that is the path forward to realize a taoyaka society. 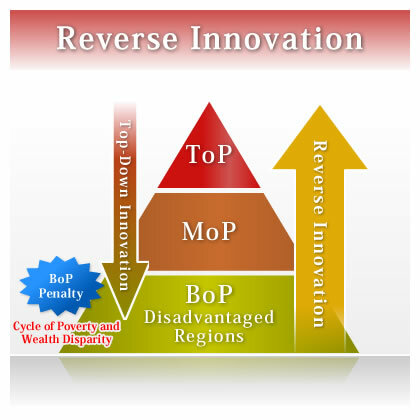 We believe that onsite reverse innovation is most required in disadvantaged regions, including societies in a spiral of poverty and wealth disparity, conflicted societies fighting each other over limited resources, societies that accept the dying out and loss of tangible and intangible cultural assets that have been handed down by their ancestors, isolated societies that cannot satisfactorily access mutual and complementary aid services. In this program, the disadvantaged areas covered as educational fields are south Asia centering on India, and semi-mountainous regions in Japan. Such regions are facing a multitude of issues related to multicultural coexistence, of which many are common to both developed and developing nations. Students will utilize their knowledge of different disciplines to work under the constraints of disadvantaged regions to take up the challenge to resolve multicultural coexistence issues. We train the students as onsite reverse innovators equipped with multifaceted thinking, autonomy, execution skills, and creativity. The ability to use one’s academic knowledge in the humanities and science and technology to gain an overview of the field demand based on the specific issues being faced in the region, and identify an executable resolution measure from various viewpoints and approaches, flexibly and promptly. Rather than simply providing a solution for the field demand in question, the ability to propose and create one’s own new framework for a taoyaka society, one in which culture and technology mutually enhance one another in the regional society. The ability to develop and propose concrete plans to execute resolution measures in group organizations with different backgrounds, objectively analyze and evaluate alternative measures, negotiate with others, organize teams and achieve goals with a sense of ethics. Based on the constraints in the disadvantaged regions, the ability to mobilize one’s cross-disciplinary knowledge to develop science and technology that meets the field demand as well as the policies and systems to support it, inviting the creation of a new regional culture.